As keen cyclists will know, bike storage is an awkward business. For anyone living in a small flat (which is a lot of us), a bike eats into valuable floor space. You don’t want to be tripping over your pedal as you go up the stairs, or down the hallway. And besides, assuming you’ve forked out for a decent bike, you might want to show it off. Even if you do have a small outdoor space for your bike, cramming it in the shed tangled with tools, the lawnmower and other gardening bits and bobs can make it hard to get out quickly if you are in a rush. So, here are some smart and stylish ways to store your bike while saving space in your flat or house. Hows this for an inventive way to store your bike? Effectively killing two birds with one stone, this clever desk from Chol1 is designed to incorporate your bike, with slots that keep the tyres in place. The desk can accommodate three different wheel sizes. Made from pine, it comes in three finishes – white, natural and dark. Display your bike like a piece of art, with a wooden plaque that serves as a wall rack. The Bike Hanger 2.0 draws inspiration from antlers – handmade from a wooden shield and handlebars, it can be found at Crowdyhouse. Vertical bike storage is possibly the best solution for very small homes – or office spaces. This system is also ideal for flat-shares or family houses where three or four bikes need to be stored. The Endo is a fairly straightforward wall-mounted storage system that can be folded flat when not in use. Available in fun, bright colours (yellow, green, pink, blue, red – as well as black and white), the Endo is an affordable option too, at £39.95. A room divider and bike storage in one? Unusual, yes, but that’s exactly what this curious unit is. Post Fossil’s Swiss-made ‘Shoes Books and a Bike’ provides a platform on which to display a cyclist’s most treasured of items. It allows further shelves for helmet or shoe storage. 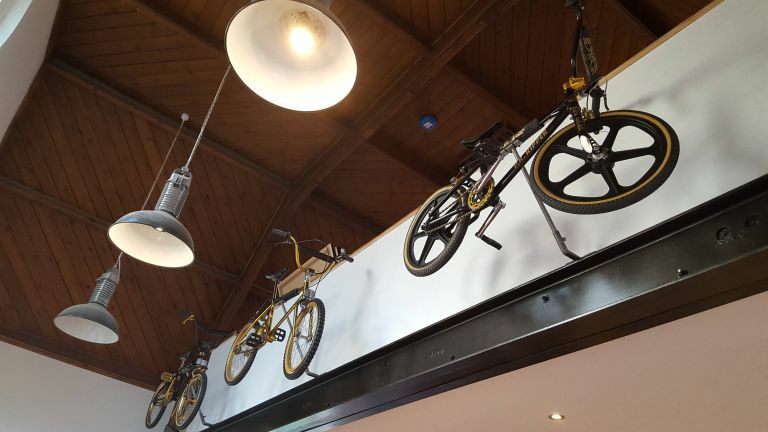 If your home features particularly high ceilings, use that extra bit of wall space to store your bike. A simple wall bracket that bolts to the wall will do the trick. OLIVEROSshelves’ wall brackets come in one size (90cm) but can be cut depending on how big your bike is. If you’re planning on leaving your bike outside, you’ll probably want a super-secure solution. Protect a Cycle offers this. Bolted down onto concrete, this galvanised metal bike storage shed will house up to three adult bikes. Not only that, but padlocks, ground anchor and security chain all come included. For those who count both cycling and skateboarding (or, indeed, surfing) as hobbies, the Brooklyn Bike and Board Rack should tick all the boxes. Two surfaces are provided on which to store books, helmets or ornaments. Made from solid ash wood, this cute shelf is perfect for narrow hallways. For renters, bike storage that doesn’t involve drilling into your walls is obviously going to be preferable. The wall-leaning Michelangelo Two Bike Gravity Storage Rack uses (as the name implies) gravity to provide sufficient support. Rubber bumpers protect walls and floors – and with a silver-coated finish, it’s easy on the eye too. Displaying your bike above the bed certainly makes a statement. But the Hero system has a knack for turning regular old bikes into installation art. With this simple but smart wall fixture you can store your bike horizontally in left or right orientations. Like the the Endo, it’s available in a range of bright colours. Opt for non-bike-specific storage ideas, like simple pegs. Bike aside, you can sling your bag, jacket or scarf over these handmade wooden hangers (£54.31, Etsy). And, they come in a tempting 19 different colourways. You could just sandwich your bike between your sofa and the wall. But then again, you could invest in a sofa that actually stores your bike. The S1LLÓN features a sort of bench at the back with grooves for your bike to sit in. This is a nice option for those who don’t want to store their bike in the hall or on the wall. If you live in a flat but have a balcony, you’re onto a winning storage space for your bike. Under shelter (but out of your living room) your bike will be dry, safe and secure. Fix a couple of hooks to the wall so that you can keep it off the ground, while reserving space for that BBQ. Ikea sell suitable hooks, for indoor or outdoor use (£1.75). Useful not only for bikes but also for ladders, kayaks – anything that takes up too much floor space – consider a ceiling hoist for your storage needs. This contraption by Delta (£34.86) uses a pulley system to efficiently lift and lower items, perfect for garage storage. If you have space for your bike inside, but want to avoid leaving dirty tyre tracks on your floors, try a cover-up tactic. The Velosock cover (£43.11) is as simple as it sounds – a one-size-fits-all washable sock for your bike. If you’re prone to weekend biking trips, this bad boy will keep your car boot clean, too. Sometimes simple is best, and a bike stand is about as straightforward as it gets. The Hobo is both a display and a workstand for cleaning, servicing or just plain storing your bike. Available in red, green, white or black, it can be used indoors or out. Looking for more storage inspiration?